When speaking about fashion and some of the designers who have elevated its status as glamorous and important then Giorgio Armani’s name will definitely come up. 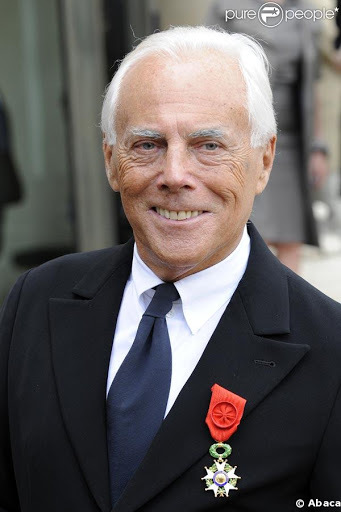 There are a lot of great and iconic designers out there and Armani is certainly one of them. Born in Italy and made his mark all over the world, Armani has led a colourful and interesting life. Armani is associated more with menswear as they seem to appreciate his clean tailored lines the most. Men love their Armani suits and it doesn’t look like it’s changing anytime soon. 1.As of 2013, Giorgio Armani had a personal fortune of about $8.5 billion. 2. He didn’t start out wanting to go into fashion; he studied for three years and later joined to Army. After his stint as military man, he worked as a window dresser at the department store, La Rinascente and later found work as a salesperson in the menswear department. This is where he gained some experience that spurred his venture into design. 3. Armani is credited with creating the first-ever bomber jacket; that was in 1970. 4. This Italian designer has made costumes for more than 250 films; one of them was for Richard Gere in the thriller, American Gigolo (1980). He is also known to have made many stage costumes for Lady Gaga. 5. He has never been in debt and is the sole owner of his empire. 6.Giorgio Armani does not only like sports, he has found a way to be involved in it. He is an Inter-Milan fan and the president of Olimpia Milano basketball team. He has designed outfits for Chelsea FC, for the Italian flag bearers at the 2006 Winter Olympics and for Italy’s 2012 Olympic team among others. 7. He had to sell his beloved car, a V.W Kafer, in 1975 to finance his business. 8. Armani owns 12 labels some of which include Emporio Armani, Armani Dolci – a confectionery line and Armani Fiori, a flower business. He also owns a collection of hotels which include the Armani Hotel located at the Burj Khalifa in Dubai. 9. Giorgio Armani owns nine homes. Five of them are in Italy, one each in France, Switzerland, Antigua and the U.S. The last one is a 150-foot yacht named Main. 10. He is 84 years old this year (born July 11, 1934) and in 2015, he celebrated the 40th anniversary of his brand, Giorgio Armani.